Mari Hannah, the new chair of Theakstons Old Peculier Crime Writing Festival in Harrogate. Most award-winning crime story writers like to talk to real people in the justice system as part of their research. As a former probation officer attacked on duty and subsequently pensioned out, Mari Hannah, the new programming chair of Theakston’s Old Peculier Crime Writing Festival, has never had that problem. She says she got over that dark time partly by taking up a writing and it’s led to a growing list of memorable characters and successful gritty modern crime novels based in the north east where she lives - with her partner, who happens to be an ex-murder detective. Taking over from previous chairs of this internationally important - and fun - annual Harrogate event such as Val McDermid and Lee Child is another step into the light for this gripping writer. In fact, she couldn’t be happier about the appointment. Mari Hannah said: “I was very happy and proud to be asked to do it. I don’t think there is another festival like it anywhere. “It’s a unique event. That whole buzz when you get to Harrogate. Everyone is so friendly. “Readers absolutely adore it and they can get up close and personal with the writers. “There’s no bitchiness among crime writers. From the word go they are always willing to give a new writer a leg up. 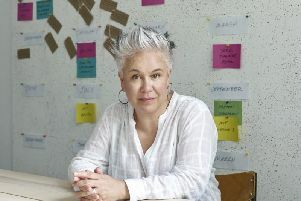 Influenced by the likes of Michael Connelly, Ian Rankin and Val McDermid, she first picked up pen and paper, or type writer, rather, in the early 1990s after the attack meant she was in and out of hospital for two years. Her latest book, The Scandal, published by Orion Fiction, is the third to feature male-female police double act DCI David Stone and DS Frankie Olive. The books begins when DS Frankie Oliver arrives at the scene of a fatal stabbing one cold December day and is shocked to discover that she knows the victim, Chris Adams. Chris was Frankie’s childhood friend; a budding journalist with his eyes on a big scoop. The question is, was this a mugging gone wrong or was someone trying to stop Chris from exposing a scandal? Like previous authors who've found their feet at Theakston’s Old Peculier Crime Writing Festival over the years such as Ann Cleeves of Vera fame, Mari’s stock is on the rise. Another of her popular characters, lesbian detective DCI Kate Daniels, has now been optioned for TV. That Mari herself is as much of a crime writing fan as audiences is a not uncommon phenomenon in the trade. It helps explain the rare and special atmosphere at Theakston’s Old Peculier Crime Writing Festival which will run for the 16th year from July 19-21 in the Old Swan Hotel in Harrogate. London-born Mari said: “Writers are usually great readers, too. I know I’ve got big shoes to fill at Harrogate but Lee Child has been so supportive. As high as the festival’s reputation has risen since being launched by Harrogate International Festivals in 2003 , this latest chapter is bursting with, perhaps, the most exciting and imaginative events so far. Personal appearances by crime writing royalty include Jo Nesbo, Jeffery Deaver, Harlan Coben plus Jed Mercurio, writer of BBC’s current hit crime drama In The Line of Duty. One particularly mouth-watering moment in prospect will see Val McDermid in conversation with Scotland’s First Minister, Nicola Sturgeon. Proof, if it were needed, perhaps, that reality can be stranger than fiction. Mari Hannah is also Reader in Residence for Harrogate International Crime Writing Festival. She is a keen supporter of The Theakston Old Peculier Crime Writing Festival's 11th Big Read and will be taking it on tour this summer when she will be discussing thriller The Black Echo by Michael Connelly. Thanks to the publishers, Orion, 1,500 free copies of The Black Echo are available and can be collected at any participating library across North Yorkshire and the north east or the Harrogate International Festival Office from this month onwards.